I took this photograph in the foyer of Zart Art in Lexton Road, Box Hill, here in Melbourne. I hope you find it as inspirational as I did in thinking about the 2012 London Olympics. During my 26 years of teaching Art, Zart has provided outstanding support with Professional Development, Workshops, new products and an enormous range of quality art materials in an “Art Supermarket” style store. Another great feature of Zart is its Student Gallery which showcases the artworks of Victorian students, both Primary and Secondary. Zart is well worth a visit either on line or in person. On Monday 16th July Victorian Schools will be back at work after a refreshing two week Winter break. In our Art Room Mali, a 70cm tall fibreglass model of Melbourne Zoo’s baby elephant, is partially decorated. Along with 54 other models it will be displayed at the Zoo during the Zoo’s 150th Birthday celebrations in October. Our Grade 4 students have begun painting their designs onto the model and, although she is less than half finished, she is taking on a life of her own. She features the Art Elements – line, shape, colour, texture, tone etc and a few surprises. 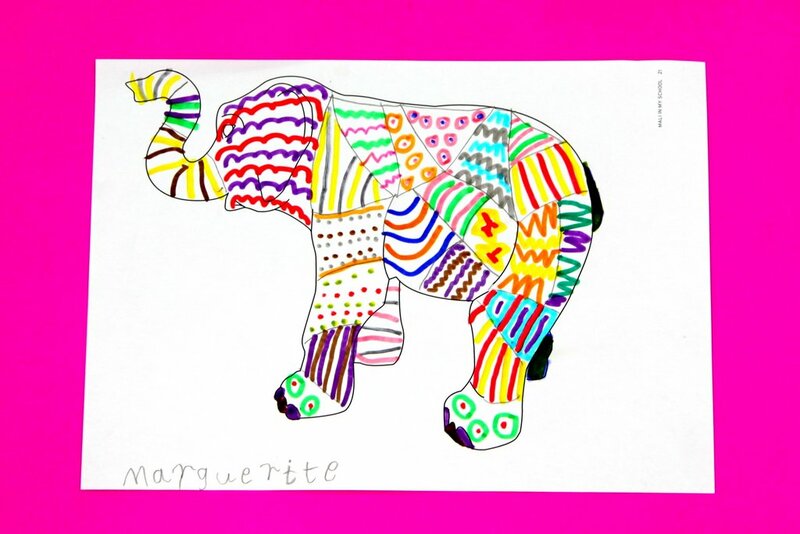 Our younger students have enjoyed seeing her progress and have all tried decorating an elephant outline provided by the Zoo’s education unit. 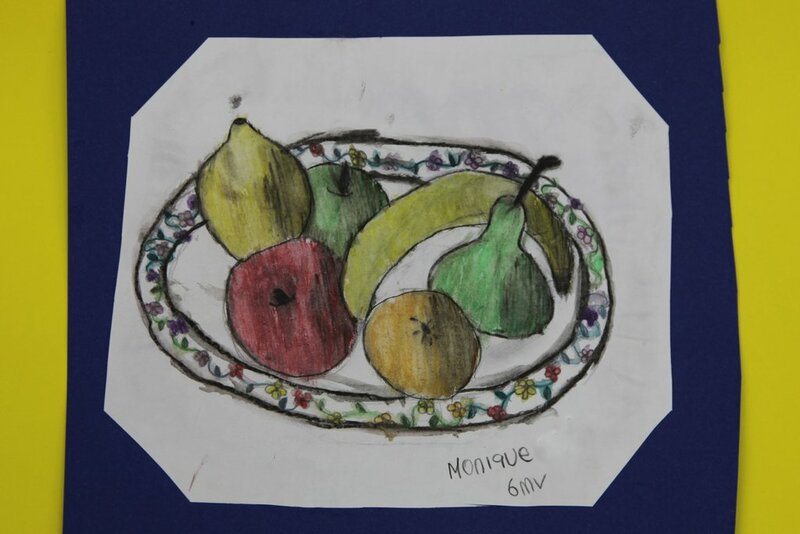 Marguerite is a Prep Student whose use of pattern is outstanding. 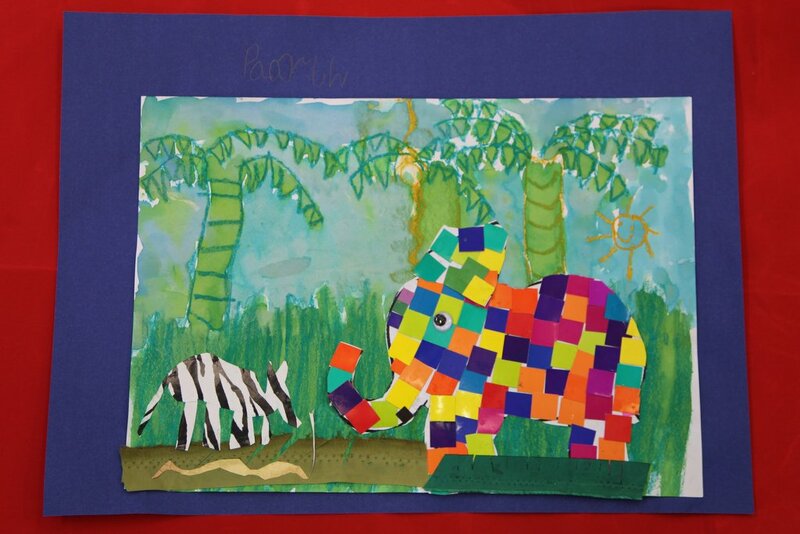 Paarth, also a Prep, is a new student to our school and has created a very colourful “Elmer The Patchwork Elephant”.Congratulations to both students. 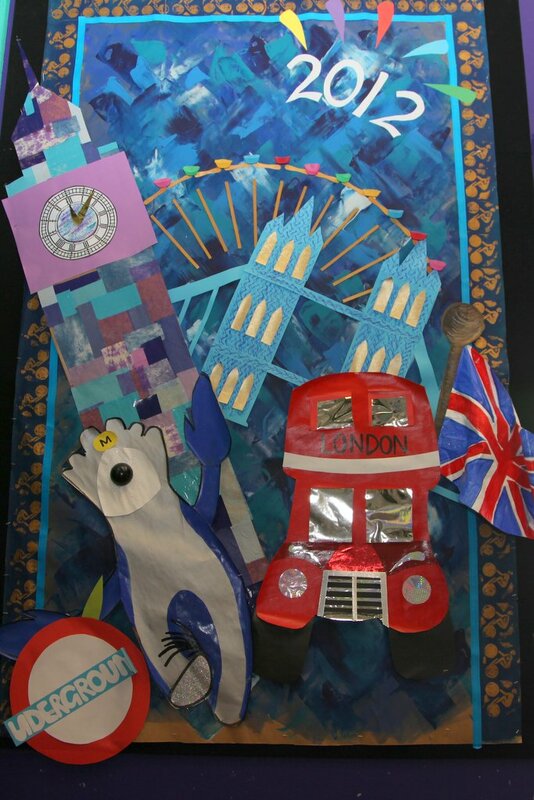 Our Grade 5 and 6 students have been looking at the work of English artist David Hockney. 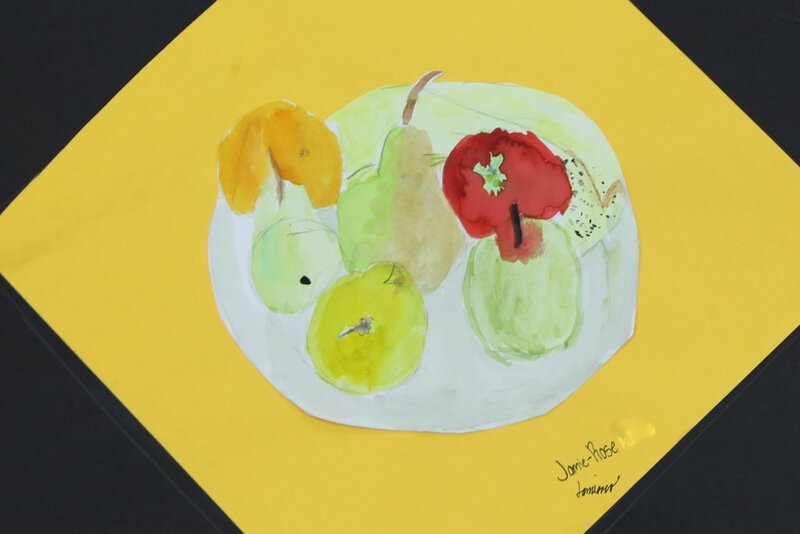 In preparation for printing a still life like his “Apples Pears and Grapes” 1986 they tried drawing one using bowls of fruit directly in front of them. Once we established that they should draw only what they saw and not every part of each fruit they found the activity relatively easy. Colour was added with watercolour pencils or paints. 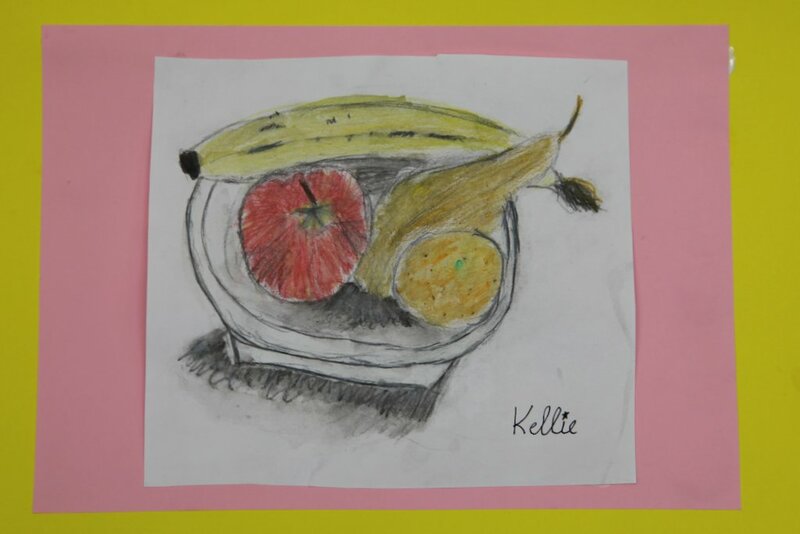 From the Art Teacher’s perspective I thought the $37 I spent on fruit was well worthwhile and the artwork delightful. For mess free Still Life composing the NGA’s Still Life Composer reigns supreme.